I've been asked many times how I shape the heads of my toys so they don't just look like round blobs. While proper stuffing helps a lot, I have a little trick that helps the face keep it's shape. Here you can see a very basic diagram I've drawn. It shows the toy head from the front, so you see both eyes and the nose. The blue line shows the seam. I have drawn the diagram as if you were using safety eyes, so they are already attached. 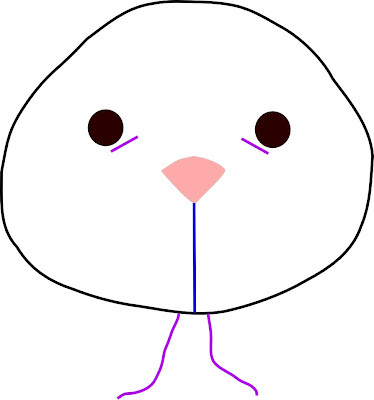 The purple lines show where to make the stitches to shape the head. You'll need a tapestry or soft-sculpture needle with about 12" of yarn the same colour as the face. Insert your needle with yarn at the bottom of the head, have it come up just under one eye, and make a short stitch towards the centre of the face. Have the needle and yarn exit the head near when you started. Then snug up the yarn to shape the face, and knot the yarn securely. Repeat this for the other eye. If you are using buttons for eyes, the process is the same, except you are making the stitches through the buttons, and you'll want to use heavy thread instead of yarn. Passing the thread through the button 3 times is usually enough to hold it on securely. This process also allows you to hide the yarn or thread ends when you sew the head to the body. I hope this was helpful! I am thinking of making a video of the process for my blog, but I'm not sure when I will have time to do that. Posted by Barbara Prime at 9:10 a.m.
great post, I never seem to get my faces to come out just right, hopefully this diagram will help me. November 14, 2008 at 8:43 p.m.
November 15, 2008 at 8:12 p.m. This made such a difference to the face of my newest pupster! November 22, 2008 at 1:42 p.m.
March 27, 2010 at 6:06 p.m.